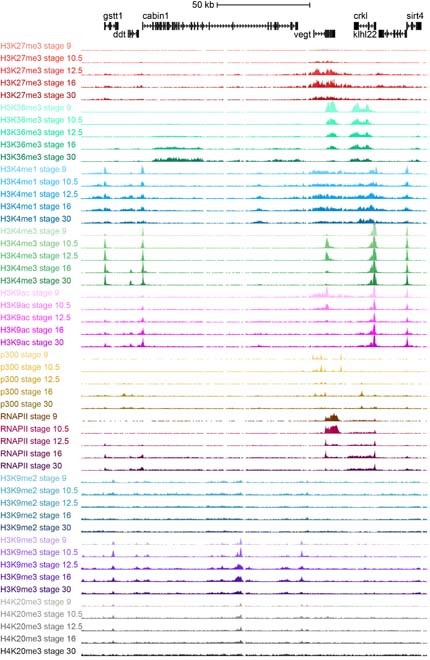 A track data hub has been generated providing access to Veenstra lab chromatin state maps, including ChIP-sequencing tracks of eight histone modifications, RNA polymerase II and the enhancer-binding protein p300 during Xenopus tropicalis development from blastula to larval stages. Intergenic DNA contains functional genomic elements such as enhancers which are largely unannotated. The biochemical features of chromatin, such as post-translational modifications of histone proteins, determine its accessibility and function. The combination of different histone modifications can also be used to partition the genome in distinct chromatin states, such as promoters, enhancers, transcribed regions, and repressed heterochromatin. The genome browser tracks have been generated for the histone modifications H3K4me1, H3K4me3, H3K9ac, H3K9me2, H3K9me3, H3K27me3, H3K36me3 and H4K20me3, in addition to RNA polymerase II and p300. At five stages of development (NF stages 9, 10.5, 12.5, 16 and 30) they have been mapped with or without repetitive reads, to allow assessing histone modfications at repetitive heterochromatic regions as well as unique regions within the genome. In addition they have been mapped to the two newest X.tropicalis genome assemblies (v7.1 and v8.0). Click the button "track hubs"
Select the tab "My Hubs"
The newly added trackhub and its corresponding genome should be the default in the Genome Browser Gateway (home) page of the UCSC browser. If the trackhub is not selected, or to select the trackhub again among previously loaded trackhubs: In the genome browser click the top menu item "Genomes" to go to the Genome Browser Gateway page. To the left, under "Represented speces" the track hub "Xenopus UCSC hub" should be listed. Click it to select the trackhub. Select the Xenopus genome and assembly of interest under the drop-down under "Find Position", and click "Go" to move to a position in the genome. The generation of Epigenome reference maps has been supported by the US National Institutes of Health (NICHD, grant R01HD069344). Please note that the track hub includes published data but also provides pre-publication access to data. The unpublished data can be freely used on a per gene locus basis. Please contact Gert Jan Veenstra for other use. Published data have been deposited in NCBI's Gene Expression Omnibus and are accessible through GEO Series accession numbers (listed with the publications below). Elurbe DM, Paranjpe SS, Georgiou G, van Kruijsbergen I, Bogdanovic O, Gibeaux R, Heald R, Lister R, Huynen MA, van Heeringen SJ, Veenstra GJC. 2017. Regulatory remodeling in the allo-tetraploid frog Xenopus laevis. Genome Biol., 18, page 198 (doi: 10.1186/s13059-017-1335-7.). Hontelez S., I. van Kruijsbergen, G. Georgiou, S. J. van Heeringen, O. Bogdanovic, R. Lister, G.J.C. Veenstra. 2015. Embryonic transcription is controlled by maternally defined chromatin state. Nature Commun., 6, 10148 (doi: 10.1038/ncomms10148). Heeringen, S.J. van, R.C. Akkers, I. van Kruijsbergen, M.A. Arif, L.L.P. Hanssen, N. Sharifi, G.J.C. Veenstra. 2014. Principles of nucleation of H3K27 methylation during embryonic development. Genome Research, 24, 401-410 (doi: 10.1101/gr.159608.113). Paranjpe SS, U.G. Jacobi, S.J. van Heeringen, G.J.C. Veenstra. 2013. A genome-wide survey of maternal and embryonic transcripts during Xenopus tropicalis development. 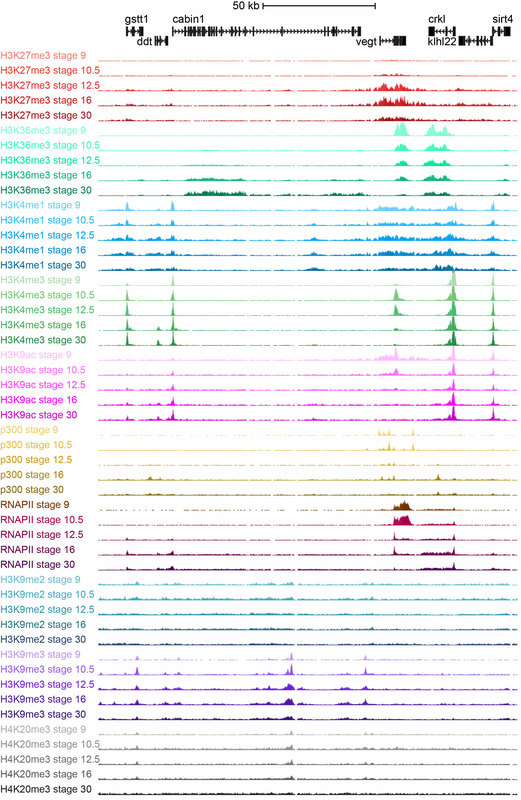 BMC Genomics, 14,762 (doi:10.1186/1471-2164-14-762). Bogdanovic, O., S.W. Long, S. J. van Heeringen, A.B. Brinkman, J.L. Gómez-Skarmeta, H.G. Stunnenberg, P.L. Jones and G.J.C. Veenstra. 2011. Temporal uncoupling of the DNA methylome and transcriptional repression during embryogenesis. Genome Research, 21, 1313-1327 (doi: 10.1101/gr.114843.110). Van Heeringen, S.J., W. Akhtar, U.G. Jacobi, R.C. Akkers, Y. Suzuki, G.J.C. Veenstra. 2011. Nucleotide composition-linked divergence of vertebrate core promoter architecture. Genome Research, 21, 410-421. Akkers, R.C., S.J. van Heeringen, U.G. Jacobi, E.M. Janssen-Megens, K.J. Françoijs, H.G. Stunnenberg and G.J.C. Veenstra. 2009. A hierarchy of H3K4me3 and H3K27me3 acquisition in spatial gene regulation in Xenopus embryos. Developmental Cell, 17, 425-434.